Tucson, Arizona: Carolyn Leigh, 2009. Series variant. 9 x 6.125"; 5 pages. Dos-a-dos structure. Materials: Acid-free commercial book papers; Tyvek hinges; Ph-neutral PVA glue; Golden and Daniel Smith acrylics. Text stamped with Versafine Archival Dry Pigment Ink. 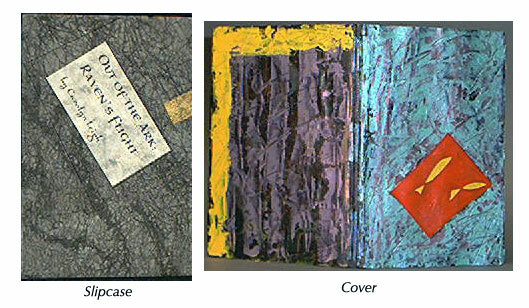 In 9.375 x 6.375 x 1" slipcase of acid free Davey binder board covered with commercial book papers painted with acrylics. Carolyn Leigh: "This book plays on the saying that a bird in hand is worth two in the bush. Perhaps now two in the bush are better. My husband and I were walking to a cafe in New Guinea when a huge, escaped pet came striding down the street. The big bird acted like it owned the town and is the model for the birds in this book, except they are in their own place in the bush. The bush designs are inspired by bark paintings in the men's ceremonial houses in the East Sepik Province of Papua New Guinea. " Tucson, Arizona: Carolyn Leigh, 2007. Series variant. 6.75 x 6.75 x .75"; 5 leaves. Dos-à-dos, two hinged panels on each side of a central connecting panel. Materials: acid free commercial book papers, Tyvek hinges, Ph-neutral PVA glue, Golden and Daniel Smith acrylics. Text: stamped with Versafine Archival Instant Dry Pigment Ink and Encore! Ultimate Metallics Ink, both by Tsukineko. 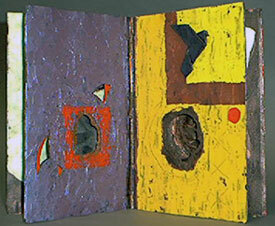 Housed in slipcase of acid free Davey binder board covered with commercial book papers painted with acrylics. The rattle in the slipcase: aluminum sheeting and BBs. Another of Leigh's Barrio y Calle series, works inspired by urban streets and neighborhoods of the towns and barrios of the Sonoran Desert and the tropical cities of the Pacific Rim. Carolyn Leigh: "The two halves of this book reflect the changes in Tucson's barrio architecture after the coming of the railroad brought eastern Anglo influences to mix with the existing Sonoran Spanish style." 8 x 5.375 x 1.375", expands to 21"; 8 panels. Four pages using flag book structure with pop-ups. Materials: acid free commercial book papers, Tyvek hinges, Ph-neutral PVA glue, Golden and Daniel Smith acrylics. Text: stamped with Versafine Archival Instant Dry Pigment Ink and Encore! Ultimate Metallics Ink, both by Tsukineko. Housed in slipcase of acid free Davey Binder's Board covered with commercial book papers, which have been painted with acrylics. Another of Leigh's Barrio y Calle series, works inspired by urban streets and neighborhoods of the towns and barrios of the Sonoran Desert and by the tropical cities of the Pacific Rim. Carolyn Leigh: "Esperanza Rising is named for a barrio in Sonora that began as shelters built with shipping pallets along an irrigation canal. Slowly the families built permanent homes with electricity and plumbing. The book shows the quiet time at sunrise, when only the building are visible, concealing the families sleeping inside. It pays tribute to the strength and perseverance of people in similar neighborhoods worldwide." Slipcase: 9.75 x 6.5 x 2.5"; clamshell box: 9.25 x 6 x 2.125"; tablets: 4.5 x 3.5". Acid-free commercial book papers, Tyvek hinges, Ph-neutral PVA glue, Golden and Daniel Smith acrylics. The "rattle" in the clamshell box is made from aluminum sheeting and BBs. The clamshell box is made from a commercial book cover. The slipcase is made of acid free Davey binder board covered with Thai momi-style paper painted with acrylics. Tablets and clamshell box finished with a costing of Renaissance Wax. Carolyn Leigh: "House of Cards" plays with the creation, collapse and recreation of our built environments - the interplay between human fragility and resilience. The tablet cards suggest possibilities even in collapse. Please play and create your own structures. The clamshell box opened upright makes a starting wall to build out from or create free standing structures, whatever works!" This is the third in the series of House of Cards. Each one in the series is unique. Tucson, Arizona: Carolyn Leigh, 2006. Series variant. Two books: 2.625 x 3.5", 2 pages; 5.75 x 8.75", 8-paneled accordion. The small book housed in 2.75 x 3.75" slipcase with title label on outside. Both it and the sculptural accordion book are housed in a 5.75 x 8.75 x 1.5" slipcase. Materials: acid free commercial book papers, tyvek hinges, Ph-neutral PVA glue, Golden and Daniel Smith acrylics. Slipcase: acid-free Davey binder board covered with Momi paper painted with acrylics. Text in small book ink-jet printed with Hewlett-Packard archival black ink. Carolyn Leigh's bookworks tend to be architectural structures reminding us of buildings and barrios. The Last Dragon is a dark piece with blacks, grays, red rust — the city in polluted mode. Leigh refers to the accordion book as a "city dragon." The Last Dragon is hiding out. Out of the Ark is a series of artists' books based on the Biblical story of Noah's ark in the Book of Genesis, Chapter 8, verses 1-12, King James Version. Verse 7, the raven's flight, is part of the oldest known written text, the "J" text, from about 950 BC. Verses 8-12, the three flights of the dove, first appear in the later P text which dates from around 550 BC. Tucson, Arizona: Carolyn Leigh, 2005. Series variant. 9 x 6 x .5", five pages, in slipcase. Mixed media using acid free paper as a base for the painted pages. Other materials include acrylic paints, Tyvek hinges, PVA glue, India ink, HP black inkjet ink, Renaissance Wax. Carolyn Leigh: "Land of the Dove depicts the Dove's search for dry land: first returning with nothing, then returning with an olive leaf and finally departing forever when she finds dry land under the radiant sun." 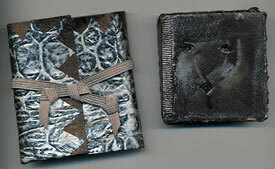 A series of artists' books based on the Biblical story of Noah's ark. Raven's Flight commingles the Biblical raven with the native American Raven. What did the raven find? Leigh's prose poem is based on Native American origin stories which identify the Earth with Turtle. Genesis 8:7 "And he sent forth a raven, which went forth to and fro, until the waters dried up from off the earth." The origami raven in Raven's Flight is based on the Common Raven, Corvus corax, which is common in the far north and the west of North America. It is identified by its wedge-shaped tail. The Painted Faces series was inspired by three different stages of mask and body art. Nightfall Faces are the dark and light spirits of forest and bush. Primary Faces are the primal, ancestral spirits of village creation histories. Harlequin Faces are the festive, carnival faces of town. 3 x 3 x .75", six pages, in wrapping with ribbon. Materials used include acid free paper, Tyvek hinges, Ph-neutral PVA glue, Golden and Daniel Smith acrylics, Renaissance Wax. The Nightfall Faces are painted in blacks and whites to suggest shadowy spirits that are unknown and unnamed. The "rattle" inclusion is the sound of something unseen in the bust at night. 3 x 3 x .75", five pages, in wrapping with ribbon. Materials used include acid free paper, Tyvek hinges, Ph-neutral PVA glue, Golden and Daniel Smith acrylics, plus a coat of Renaissance Wax on the pages. The Primary Faces Series uses primary colors to explore primal face and mask forms inspired by the New Guinea people and their ancestral spirits. The "rattle" inclusion represents the unseen, stick cracking sound of something in the jungle at night when the masali spirits come round. Each book in the series is unique. This one-of-a-kind is based on both the clan masks of the Sepik River and the body art of the Highlands tribes in Papua New Guinea. Carolyn Leigh comments: "I spend part of the year in their villages and have been lucky to see a tremendous amount of fantastic art created by artists using only the materials available to them from the jungle, the bush and the sea." 3 x 3 x .75", 8 pages, in wrapping with ribbon. Materials used include acid free paper, Tyvek hinges, Ph-neutral PVA glue, Golden and Daniel Smith acrylics, Renaissance Wax. The Harlequin Faces series celebrates the carnivals and festivals of towns. The folk spirits are not totally forgotten, but now their colors are the vibrant, complementary hues of store paints. The "rattle" inclusion is the sound of something again unnamed, but still there in the back alleys and streets. 9.125 x 6.125"; 5 pages. In 9..625 x 6.375 x 1" slipcase. Consists of acid free commercial book papers, tyvek hinges, Ph-neutral PVA glue, Golden and Daniel Smith acrylics. Slipcase of acid-free Davey binder board covered with Momi paper painted with acrylics. Text ink-jet printed with Hewlett-Packard archival black ink. Finished with a coating of Renaissance Wax on the book pages. The Barrio y Calle series is inspired by urban neighborhoods and streets. This piece concerns the contemporary calaveras [prints of skeletons doing everyday activities, which have a long and developed cultural history] as skeleton musicians return for a barrio celebration of the Day of the Dead. The scenes tell the story: the night singer; the beat goes on, riff on bones, punk two tattoo, candy kiss, piano man.